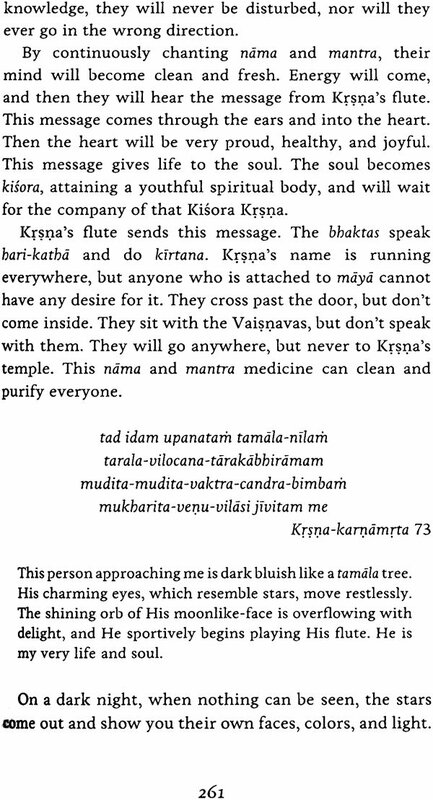 This book, Sri krsna-karnamrta, Nectar for the All-Attractive offers hope to sincere aspirants on the path of bhakti-yoga. Hope and a guiding lamp, it sheds light on a land where Absolute Truth and Absolute Beauty live as one in the All-Attractive Divinity, a fresh youth who sits with cupped ears, thirsty to drink the nectar springing from the lips of His beloved devotee. All beings yearn for love, for all beings are sparks of the Supreme Love. That Love is waiting for us all with arms outstretched, eager to embrace His lost servants. The Divine Potency, Srimati Radharani, keen to fulfill Her Beloved's every want, sends Her confidential associates to this world to deliver the fallen souls. Like ladders descending into a deep and dark well, our Gaudiya saints have come, extending their hands to lift us up and carry us across the fearsome ocean of repeated birth and death to our souls' eternal home in Vraja. Such saints have offered the highest possible destination to the most wretched, granting entrance into the loving service of the Divine Couple, Sri Sri Radha- Krsna. A Gaudiya saint of the highest caliber, our Divine Master, Om Visnupada Bhaktabandhava Sri Srimad Bhaktivedanta Narayana Cosvami Maharaja, Srila Gurudeva, appeared in this world in the village of Tiwaripura, Bihar, in 1921, and re-entered Radha-Krsna's eternal pastimes in December 2010. He was an unprecedented revolutionary, fearlessly spreading to the entire world the message of pure devotion to Sri Krsna through the guidance and service of Srimati Radharani. It may appear to the unobservant eye that our beloved master and guardian Srila Gurudeva has departed, leaving us forsaken. His intimate servants emphatically teach us that this is not so. Srila Gurudeva is waiting just behind the curtain of our mundane perception, like a mother who tells her children she is leaving home, only to remain hidden to watch their actions in her apparent absence. Srila Gurudeva is always with us. He is our foundation rock, ever-supporting, and our fountain of life, ever-nourishing our souls with the nectar topics of Sri Sri Radha-Krsna. Srila Gurudeva is always present in the eternal pastimes of Sri Sri Radha- Krsna and, from there, he nourishes his followers with bari-katha by speaking through the flute-like vessels of his pure-hearted disciples. Srila Gurudeva's vani is eternally present, although sometimes it is manifest and sometimes it may be hidden. If a man records someone speaking, then he can later hear the speech at will. Some may say, "That was spoken in the past–it is gone." But the recording is present and, whenever one likes, one can listen to it. 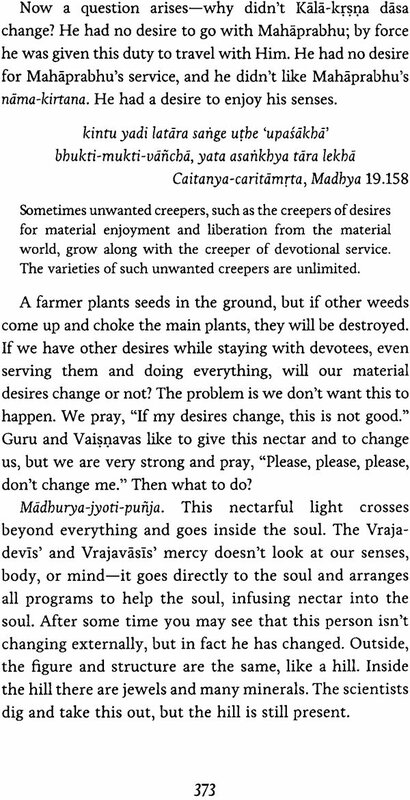 Similarly, for those in whose hearts Srila Gurudeva is present, all Gurudeva's Vani is present in their hearts as well, and, whenever Gurudeva inspires them to, they will manifest that guru-Vani for the benefit of the world. 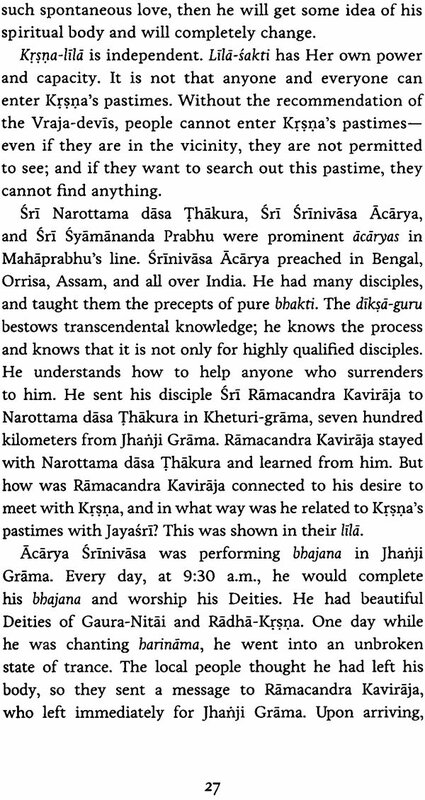 Srila Svarupa Damodara and Srila Ramananda Raya fully understood and fulfilled Sri Caitanya Mahaprabhu's manobhista, His innermost heart's desire. However, when Mahaprabhu traveled to South India, He went without anyone who understood or was favorable to His internal mood. He took only Kala Krsna Dasa, a neophyte whose presence was of no consequence. Mahaprabhu travelled to remove the living entities' jada-anuraga, or material attraction, by bestowing a higher taste of spiritual love. 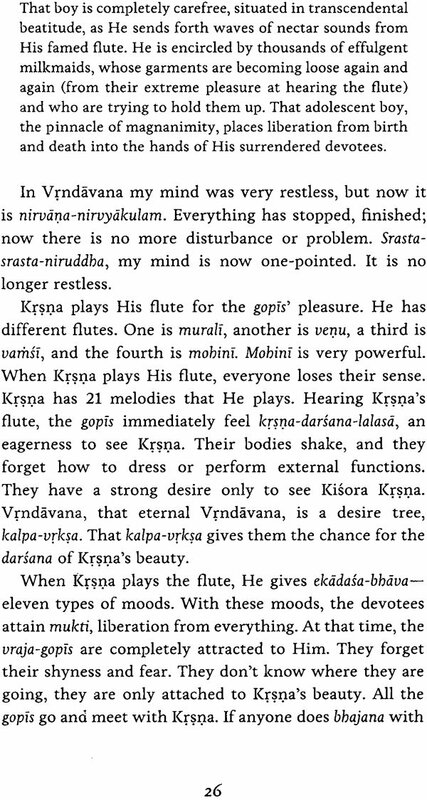 He was deeply absorbed in vraja-bhava and contemplated how to distribute the most exalted glories of the Vraja-devis and their moods to the world. It was no easy task to reveal the glories of His intimate associates before the minds of fallen souls suffering from the heart disease of lust; therefore He did not take them along with Him. 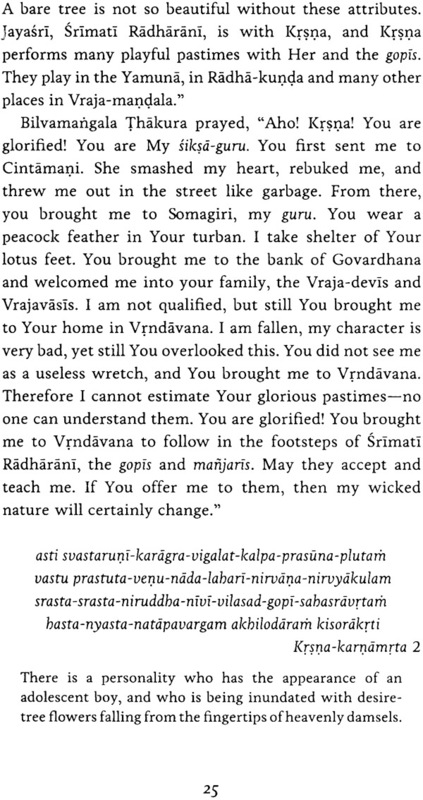 He considered, "First I will develop their respect for Svarupa Damodara and Ramananda Raya, then I can bestow this anuraga of the Vraja-devis." To perform this great task, Mahaprabhu took the help of Sri Brahma-samhita and Sri Krsna-karnamrta. In the hearts of South Indians, the conception was present that Sri Visnu is the one and only worshipable Lord. Through the Brahma-samhita, Caitanya Mahaprabhu established that Krsna, Govinda, is the Supreme Absolute Truth, and that Visnu and all the demigods are His expansions. And through Krsna-karnamrta, Mahaprabhu showed that mundane rasa is contemptible, insignificant, the cause of unlimited insatiable desires, and untold misery. In whatever amount you give shelter to mundane rasa, to that extent you destroy the interests of the soul. That thing for which the entire world is running, and which all people advise others to strive for, is the very substance sending everyone into the mouth of misery and destruction. Therefore, Mahaprabhu showed how Srila Bilvamangala Thakura, who was at first infatuated with the mundane rasa, became inclined towards Sri Krsna and attained bhagavata-rasa, the transcendental taste of pure love. 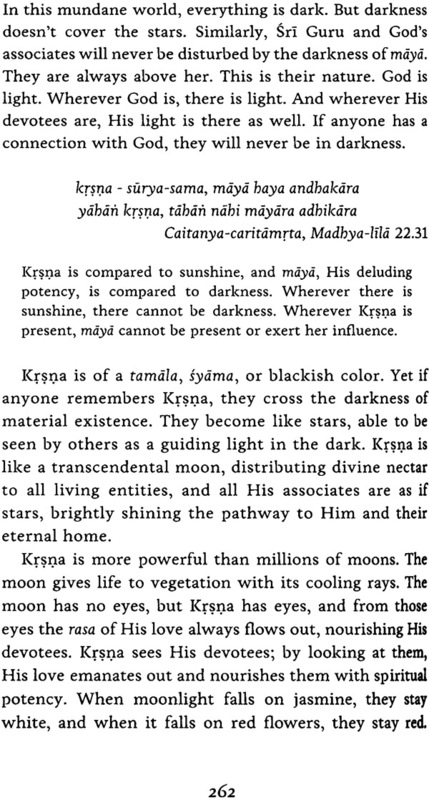 Then, with that rasa, he nourished and freed other souls from their anarthas and mundane attachments. First, Srila Bilvamangala Thakura freed himself, and then he blest all others. By that rasa, Bilvamangala Thakura controlled even God Himself, who sat at his side as a little boy, eager to drink the nectar of his singing. 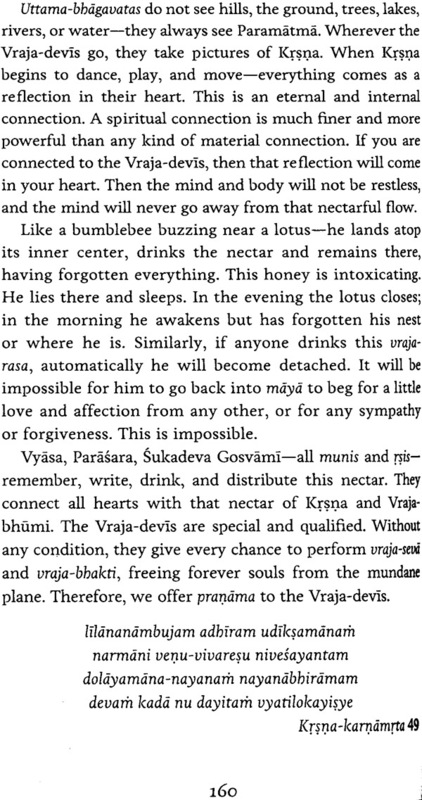 The mind becomes restless and the body undergoes transformations of lust as an effect of the mundane rasa, but by becoming attracted to the transcendental rasa, and running to attain that pure love, one will no longer run to quench the desires of his senses, and the disease of lust can be destroyed for all time. Anyone who faithfully hears or describes the Lord's playful affairs with the young gopis of Vrndavana will attain the Lord's pure devotional service. Thus he will quickly become sober and conquer lust, the disease of the heart. If one hears with faith the pastimes of Krsna with the Vraja-devis, spoken by a realized soul, and performs kirtana of these pastimes, then the disease of the heart is destroyed, and that person achieves his eternal welfare. Caitanya Mahaprabhu saw that the only method for the living entities to achieve vraja-rasa was for them to develop pure bhakti for Sri Krsna and to offer Krsna with devotion that thing He most wants. 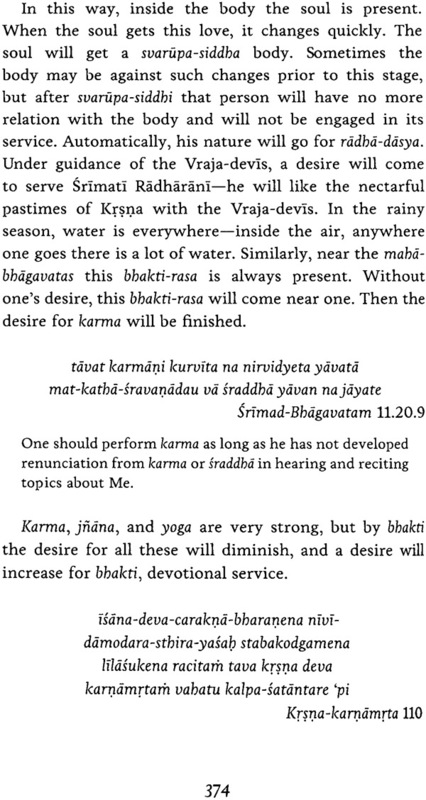 But what is nectarful for Krsna? 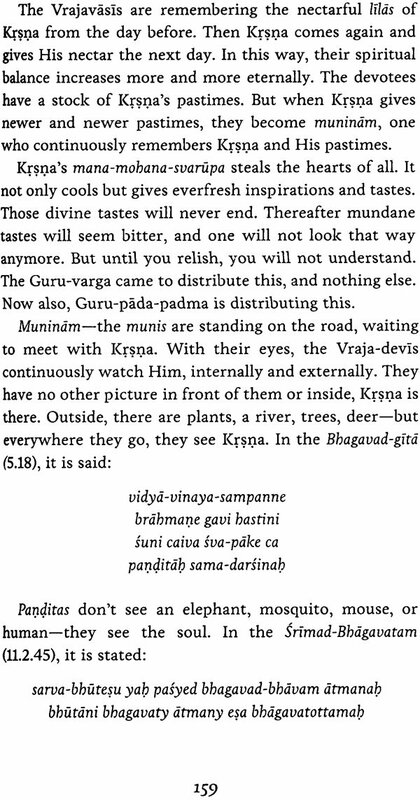 Krsna will never accept mundane objects, nor will He ever be pleased by such an offering. 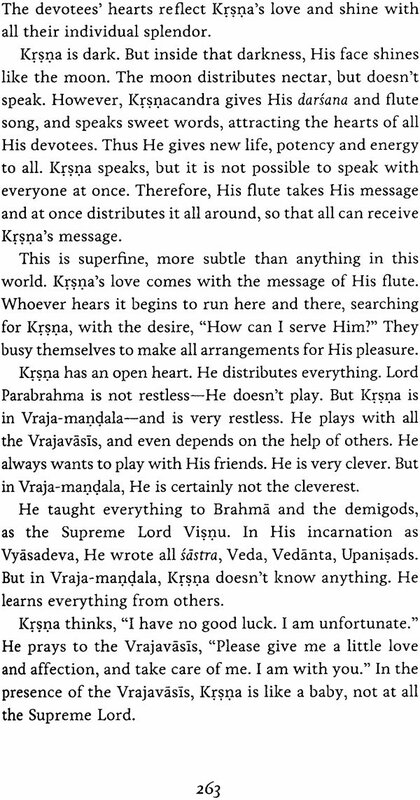 Worship of Krsna is to please Krsna. 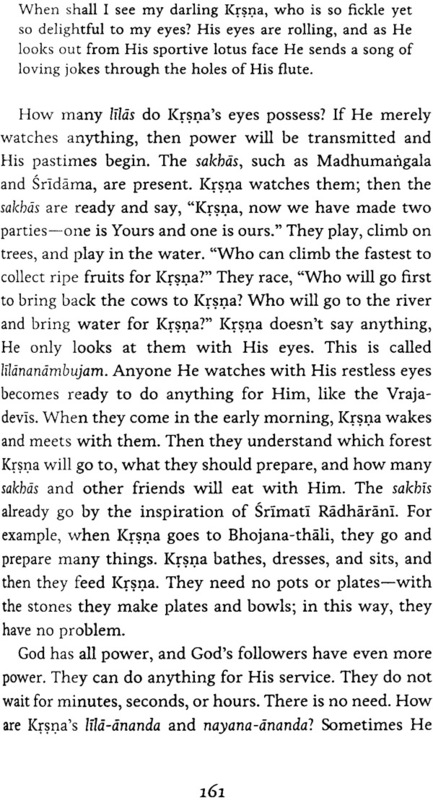 Krsna Himself is always remembering the Vrajavasis. Remembering them, He considers Himself supremely fortunate and begs for their mercy. 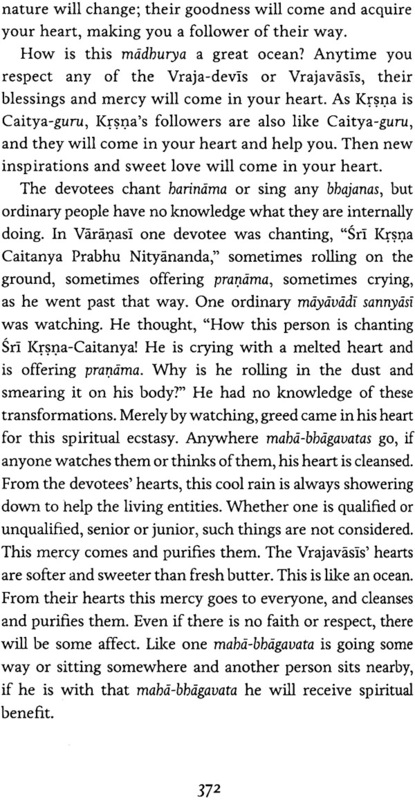 To become connected to the Vrajavasis and to understand the Vraja-devis' moods, one must continuously remember their qualities and glories. If any person remembers the Vraja-devis' lotus feet, sings their glories, explains their pre-eminence, and becomes an anuragi, or fervent aspirant for their footdust, this is the real worship of Krsna. Being pleased with that person, Krsna will then bestow qualification for service in Vraja upon him. And He will provide all facilities and good opportunities to help that person perform service. 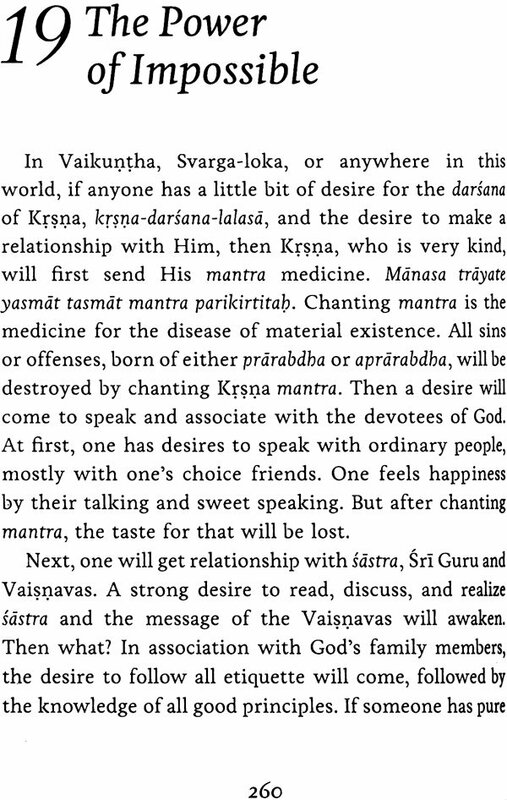 When the desire for entrance into Vraja to attain the Vraja-devis' anuraga came in the heart of Srila Bilvamangala Thakura, any scent of mundane anuraga, loving attraction, quickly vanished. Pure devotion to God is antithetical to the endeavor for one's own happiness. At the blossoming of pure devotion, any selfish motive hiding in the heart will be vanquished. The desire to gratify one's own senses is kama (lust), but the desire to please the senses of Lord Krsna is prema (love). I am not slightly concerned for My own suffering; I only desire His happiness, always. The goal of My life is to make Him happy in every way. If He feels happiness by giving Me distress, that distress is My greatest happiness. The Vraja-devis do everything for Krsna's happiness. They consider that anything done for their own happiness is the equivalent of a thunderbolt striking their heads. Any time a devotee or sadhaka contemplates his own happiness or prestige, he creates distance between himself and God. The Vraja-devis do not serve Krsna with any selfishness. They serve Krsna for His happiness. Whether He prefers to be with anyone else over us, even in our presence, is not our concern. If He gives pain to them, kicks or torments them, and doesn't acknowledge them, then the gopis consider it very good. If Krsna benedicts anyone with opulence and mundane things, this is actually a type of cheating. If He likes anyone, then He will watch their faults and reform them. The Vrajavasis are the reservoir of transcendental qualities. Their glories can only be manifest by the pure of heart. By reading and reciting this Krsna-karnamrta, deep attachment will develop for vraja-rasa and one will endeavor to realize the glories of the devotees of Vraja who are deeply attached to Krsna. Caitanya Mahaprabhu showed in this Krsna-karnamrta how anuraga, or deep attachment, can come for Krsna. Then, when the living entities cross beyond maya and run to attain this deep love, they will develop a relationship with the Vraja-devis, thus becoming extremely dear to Krsna. Aside from this anuraga, or spontaneous attraction, by no other means can one control Krsna. Caitanya Mahaprabhu showed that Krsna is pleased by the highest mellow of loving exchange, called unnata-ujjvala-rasa-sva-bhakti-Sriyam, which means to understand Krsna's desire and endeavor to please Him by taking sole shelter of the Divine Potency, Srimati Radharani. Caitanya Mahaprabhu came to distribute this highest possible attainment to the living entities of Kali-yuga. 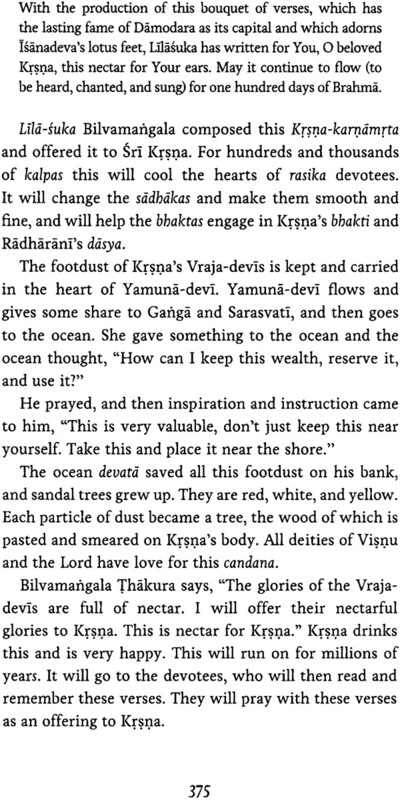 The Guru-varga are always engaged solely in spreading this rasamayi-bhakti for the welfare of the living entities. All other things they teach are only processes to take one to that final goal. Srila Bilvamangala Thakura was singing these verses, and Krsna loved hearing them so much that He wrote them down and gave them to His devotees. This Krsna- karnamrta was later collected by Caitanya Mahaprabhu and given to all the Gaudiyas as a jewel to cherish in their heart.